CBD Oil Review rates CanChew with two stars because it qualifies for the Mission & Innovation Badges. 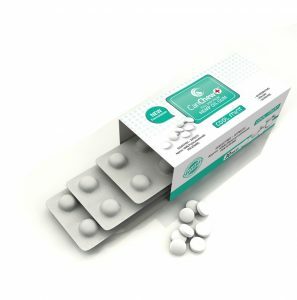 CanChew is a New Jersey-based company with a focused but innovative product line: CBD gum. The cannabidiol-infused chewing gum is not only a discreet way to access the benefits of CBD but also a good option for increasing the bioavailability of the cannabidiol oil. Still, we can’t say much more about the company, or its product. 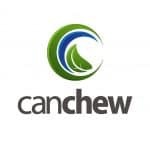 Information on CanChew itself is very sparse, and the website doesn’t offer any details about how the hemp is sourced or the results of any lab testing on its CBD. CanChew puts its whole product in the name: It’s CBD oil that customers can chew. Unfortunately, not much else can be discerned about the New Jersey-based CBD gum manufacturer or its cannabidiol. 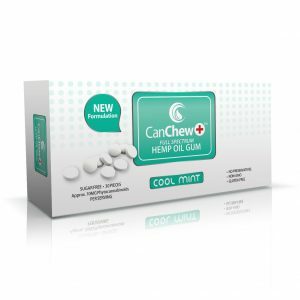 CanChew does say it utilizes full-spectrum hemp oil for its CBD gum (the only product the company sells). And we also hear and read on the site that the product is non-GMO, gluten-free, vegan-friendly, and made with all-natural ingredients. A quick look at the ingredients list shows nothing out of the ordinary for gum, and nothing worthy of a red flag. And, true to its word, CanChew uses no animal-based products or items with gluten. But we get virtually no information on what we at CBD Oil Reviews believe to be the most important ingredient: The CBD oil. Details about the agricultural hemp—where it’s sourced or how it’s farmed—are virtually nonexistent, holding us back from awarding a quality badge. Ditto for any lab results testing CanChew’s full-spectrum CBD oil for contaminants or the purity of its cannabidiol, which leaves out our safety badge. We do think it’s cool that the company offers one of the first (and only) CBD oil-infused gums on the market, but the site certainly leaves us wanting for more. Bottom line: CanChew’s range of products may be limited, but it’s at least innovative. That being said, we just can’t seem to find enough information to award our safety or quality badges. We’d love to see more on where the company sources its hemp or any third-party lab test results on the full-spectrum CBD oil the company uses. CanChew wants to help people feel better by providing all the benefits of cannabidiol in the discrete form of gum. CanChew is one of the first companies in the cannabidiol space putting CBD oil into gum.